It is one that I shamelessly copied from this lady. The only thing I changed were the colours and I cannot wait to try endless variations of colour combinations. You're right Isabelle -- positively lovely, both yours and hers! September 22, 2009 at 2:42 p.m. Hers are hot and yours are cool! Great choice if you're gonna copy. Love the classy simplicity of it. 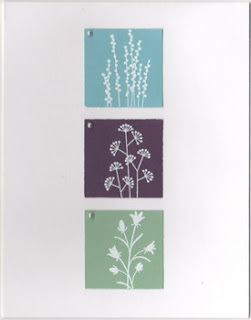 Think this design in the variety of colors would make the perfect note card set if you had to give a gift. September 23, 2009 at 6:53 a.m.